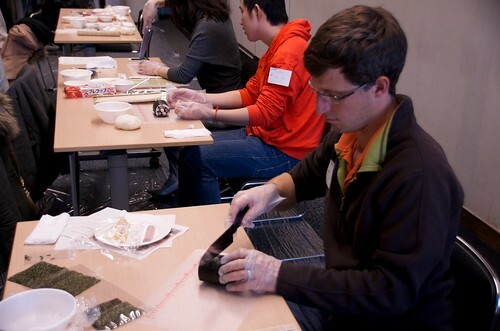 TIEC offered residents a course in decorative sushi making and I leaped at the opportunity. The course was offered in a conference room on the fourth floor of the TIEC administration building. To make the carpeted room safe for food preparation the team covered the floor in plastic. Yet another example of the Japanese penchant for taking into account every little detail when preparing things. 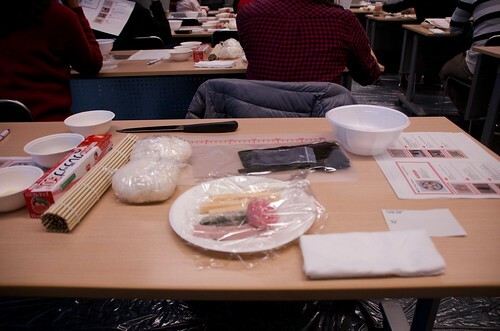 Each desk was set up to allow two people to prepare sushi. There was four shared items; a shape knife for cutting the rolls, a small bowl of water with a dash of vinegar to clean the knife between cuts, a small bowl of mayonese, and a small bowl of ground nori. 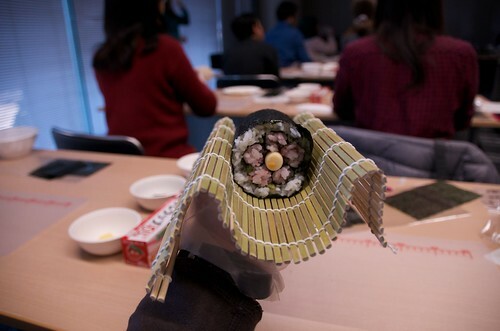 Individual items included a bamboo sushi mat for rolling, two 250g white rice balls, cut nori sheets, small nori pieces, three cheese sausages, one fish sausage, some pink fish based powder, and some green vegitable strips. We were also provided with plastic gloves to cover our hands when preparing the food. 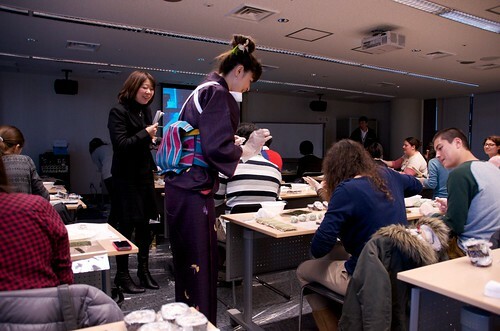 The instructor was traditionally dressed, and delivered the course in Japanese. 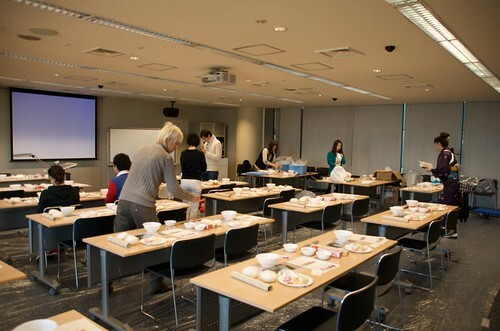 We had a translator sitting over to right of the instructor translating instructions to English. The instructor took us step by step through the process, with what she did projected on to a large screen beside where she was sitting. So while we had a translator, I found by listening carefully, and watch, I found it quite easy to follow the steps without the (excellent) translation which was provided, despite not following most of the words in Japanese (I must take lessons). Our first project was to create a Flower. My hands were busy making it, so I don't have any progress photos, but I did take one at the point of finalising the rolling. After the rolling, comes the cutting. This is where the sharp knife and the vinegar water comes in handy. You clean the blade between each slice, removing the sticky rice residue, to eventually end up with four pieces about 1.5 - 2cm thick. Throughout the instruction, normally when we were all hands on doing something a little complicated for our first time round, the instructor and translator would walk through the students, offering advice. This seemed to be appreciated by everyone! After the sushi flower the second project was a sushi frog. We made the rice green by mixing ground nori (taking half of the shared ingredient) with rice. A fantastic vegetarian option I'll remember for Shellie. Then, through some rolling, flipping of things (assisted by gladwrap), and molding and cutting, I ended up with four sushi frogs. Some small cut-out nori flakes were used to make the eye expressions. After we'd completed our projects, aside from keeping what we had made, we were told that we get to keep the bamboo rolling mat, the chopping board, and one of the instructors receipe box. All of the students were surprised, and I think this is very generous of TIEC.